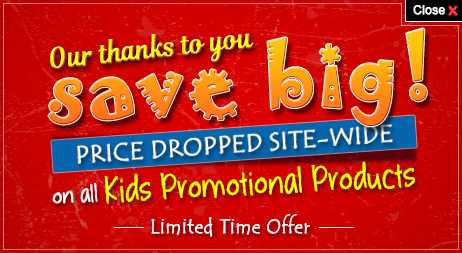 Do you want an influential and inexpensive promotional gift to acknowledge kids on your next event? You should order these personalized coils today! 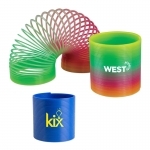 Alternatively known as slinkies, these toys are made of lightweight and perfectly balanced plastic coils that can easily carry your brand logo. The lightweight plastic used in the toy makes it a great item and our affordable prices make them perfect for any large promotional campaign. You can easily select from a large selection of colors to improve visibility of your pad printed brand logo and even opt for solid colors or rainbow colors. Each coil will expand and retract perfectly, thereby offering great visibility to your brand logo printed on it. 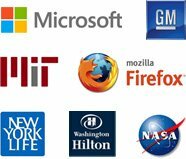 Attractive discount prices are offered on bulk orders. Free artwork assistance and free online design proof are offered on all orders. Fast shipping and fast production makes us a reliable supplier for all your promotional needs. Do you know "Everyone Loves a Slinky"? Perhaps you have heard this jingle many times before. 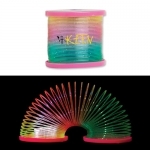 So don't you think it is good enough to place your bet on these promotional slinkies offered at Promo4kids.com?. These cool toys are available in various styles, colors and sizes that kids will love. Your brand logo will enjoy miles of exposure over these slinkies because these toys are built to travel. It means kids can take them anywhere they want such as an outdoor picnic or on regular days when they play with their friends. Have you ever thought what is so good about this simple looking toy? This simple looking classic toy can "climb" down a flight of stairs without any help. This is why these toys have been a long-time favorite of American children for many years. By positioning your brand logo on this traditional toy, your brand will be able to attract child audiences and please their parents as well who will be transported to their childhood memories of this toy. Whenever a kid carries these toys to the stairs, your brand logo will be noticed by their parents to passers-by alike. This type of visibility allows your company to be noticed anytime, anywhere These well-balanced coils are fun toys and unforgettable promotional items that will easily fit into your advertisement budget and they are small enough to be carried from one trade show venue to the other without any added effort. You can order these slinkies before the next event. If you are puzzled about the promotional benefits of these coils or other promotional gifts for kids at Promo4kids.com, feel free to get in touch with our promotional experts at 855-454-3786 from Monday through Friday (8 AM - 6 PM EST). If time permits write to us at info@promo4kids.com.